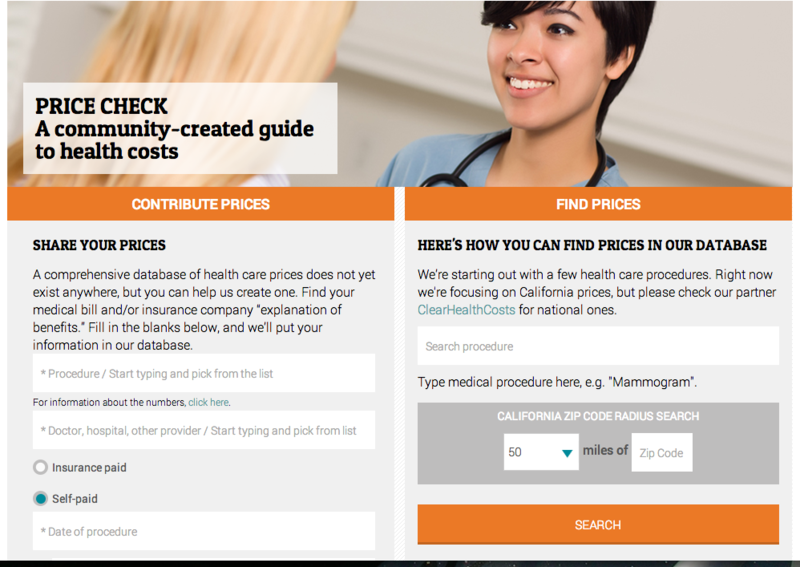 Summary: KQED, Southern California Public Radio and ClearHealthCosts.com invite California residents to share the cost of medical procedures through Price Check, a groundbreaking crowdsourced database of health care prices, which was launched today. California is one of the largest health care markets in the world and Price Check, which will be a community-created database of cost information for four common procedures, promises to be the very first database on health care costs that is created by, and easily accessible to, the public. We’re working with you, our communities, to create a community-sourced database of health care prices. By doing this, we’re attacking the problem of rising prices, one of the biggest problems we face as a nation. Each month of the pilot program, funded by a Prototype Fund grant from the Knight Foundation, will focus on one non-lifesaving procedure, encouraging California residents to share not just the charges, but also the prices paid by individuals and insurers. The first procedure for California consumers to share about is mammograms. Consumers can share prices and access the database at kqed.org/pricecheck. Names and contact information for the participants will be completely confidential. The project does not aspire to being exhaustive or comprehensive, but rather representative. Data shared by our communities in collaboration with our journalists will make it possible for us to look deeply into the issues and develop stories that will illuminate discrepancies and spark conversations. If the pilot program is successful, the project could extend past the four months. The task we’ve set for ourselves is to join hands with you, our communities. We’re doing this because the rising cost of health care is one of the biggest problems we face as a nation. One major issue: it’s often impossible for consumers to easily find out the cost of health care tests, treatments and services. That has to change. This project grew out of our pilot program with the Brian Lehrer show at WNYC public radio in New York City in summer of 2013. Here’s the launch page for that pilot, and here’s one of the resulting blog posts, which has a catalog with links to other posts in the series. A note: The closest thing to a fixed or benchmark price in the marketplace is what Medicare pays. We decided not to build that into this search engine, though we might in the next version. (It’s complicated.) Meanwhile, if you want to know the Medicare price for any procedure nationwide, you can search for it nationwide in the search engine on our front page clearhealthcosts.com. Here’s an FAQ about the project. Update: Here’s our Tumblr, which collects the coverage we have posted, our radio shows and some of the coverage of our project from around the web. Update No. 2: We’ll plan to keep this page up to date with future #PriceCheck projects. Southern California Public Radio (SCPR) is a member-supported public media network that operates 89.3 KPCC-FM in Los Angeles and Orange County, 89.1 KUOR-FM in the Inland Empire and 90.3 KVLA in the Coachella Valley. SCPR’s mission is to strengthen the civic and cultural bonds that unite Southern California’s diverse communities by providing the highest quality news and information service through radio and other interactive media. For more: SCPR.org. The John S. and James L. Knight Foundation supports transformational ideas that promote quality journalism, advance media innovation, engage communities and foster the arts. The foundation believes that democracy thrives when people and communities are informed and engaged. For more: KnightFoundation.org. RevSquare, an interactive agency based in New York, serves leading Fortune 500 media and retail companies, small and medium companies around the world, as well as start-ups trying to establish a name for themselves. For more: Revsquare.com. ClearHealthCosts.com is a New York City startup bringing transparency to the health care marketplace by telling people what stuff costs. Using a combination of shoe-leather journalism, database sourcing and curation, crowdsourcing and partnering, ClearHealthCosts.com is revealing the secrets of an opaque marketplace, and seeking to help solve one of the biggest problems we face as a nation. For more, clearhealthcosts.com.